Constitutional amendments just approved by the Ukrainian parliament have found whole-hearted support from US Assistant Secretary of State Victoria Nuland, who sees them as a sign that “Ukraine is doing its job” in meeting the Minsk agreements. The amendments passed by lawmakers in the Ukrainian Verkhovna Rada grant special status to the country’s war-torn eastern regions, as is stipulated in the Minsk agreements. The changes are said to be a step towards “decentralization” of the state. The change in Ukraine’s basic law still needs to be approved by the constitutional court in Kiev. 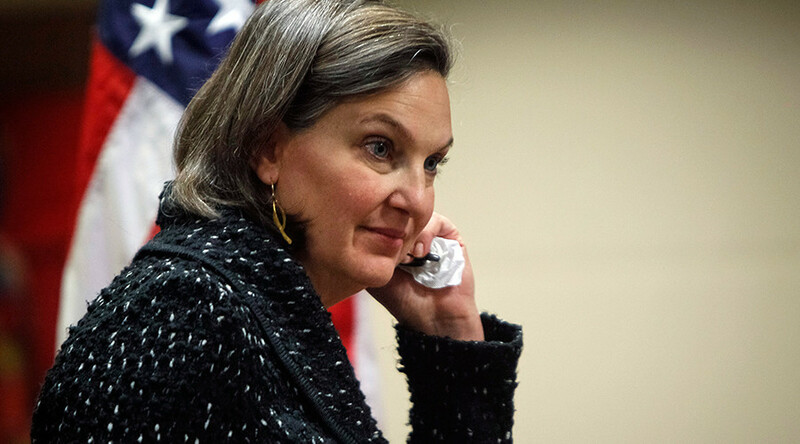 “It was very exciting to stand in the parliament and see the vibrant democracy in action; see the real debates and not fake discussions of old,” said Nuland, the Assistant Secretary of State for European and Eurasian Affairs at a press briefing at the Ukraine Crisis Media Center, according to the center’s press-release. During her two-day visit to Kiev, Nuland also pointed out that several of Ukraine’s economic reforms, passed to comply with International Monetary Fund (IMF) standards, move the country closer to getting financial assistance in the sum of $5 billion (€4.6 billion). Granting autonomous status to Donetsk and Lugansk regions was suggested in a truce agreement signed by Ukrainian President Petro Poroshenko, Russian President Vladimir Putin, as well as German and French leaders in February in the Belarusian capital. The Minsk talks, which were overseen by the OSCE, effectively led to a new ceasefire after the previous truce collapsed. The package of measures, largely based on the earlier September 2014 Minsk Protocol, is meant to resolve the conflict that broke out last April in eastern Ukrainian, leading to the deaths of over 6,500 people, according to UN estimates. Meanwhile, the Ukrainian government continued to insist on its own definition of “decentralization” for Donbass. The word was eventually included in the treaty in reference to granting some degree of autonomy to the regions in eastern Ukraine, although it was never clearly defined there. Poroshenko has contrasted it to the term “federalization” that the Russian side had initially proposed. “There is no hint on a federalization. Ukraine was, is and will be a unitary state. The project envisages no changes and can’t allow any special status for Donbass, there is just no place for it,” Poroshenko said on Thursday, as cited by RIA Novosti. The current constitutional amendments are regarded as insufficient by the self-proclaimed people’s republics in the industrial east, which originally demanded wider federalization for the country. “Kiev authorities are talking a lot about the reforms, but they are absolutely ignoring the suggestions concerning all the questions of political reforms that are introduced by representatives of Donetsk and Lugansk. That is the most crucial drawback of what they are doing,” Russian Deputy Foreign Minister Grigory Karasin said.